I’ll start off with a quick overview of the original build process, prior to discovering the old engine that was already in the car was toast. All of this took place in a two week scramble between working on customer cars and filling parts orders only to get it on the dyno with two days to spare but not being able to make a successful pull with the poor compression. 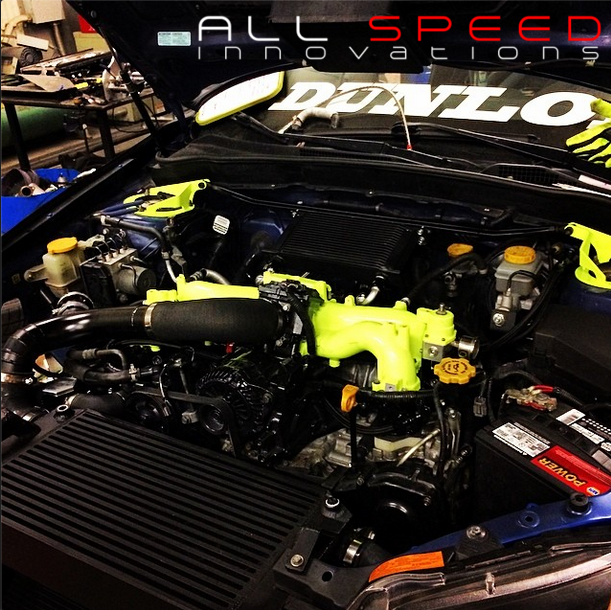 The build is focused around the Nameless Performance low mount turbo kit and v-mount intercooler/radiator combo. 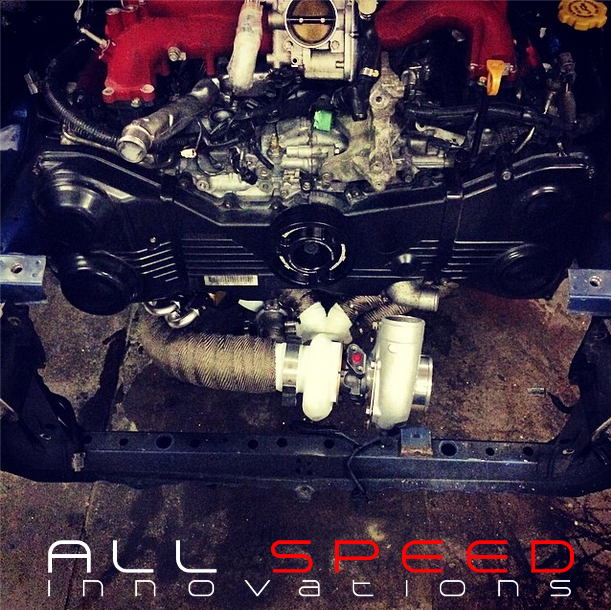 This kit was was originally built for our other time attack car by the guys at Nameless, however due to time constraints with that build we decided to push forward with installing it on this car with a slightly smaller turbo. The kit features a 321 SS manifold and 304 SS exhaust and dump tube. Our kit was built for a precision v-band turbo and Tial or Turbosmart 44/45mm EWG. 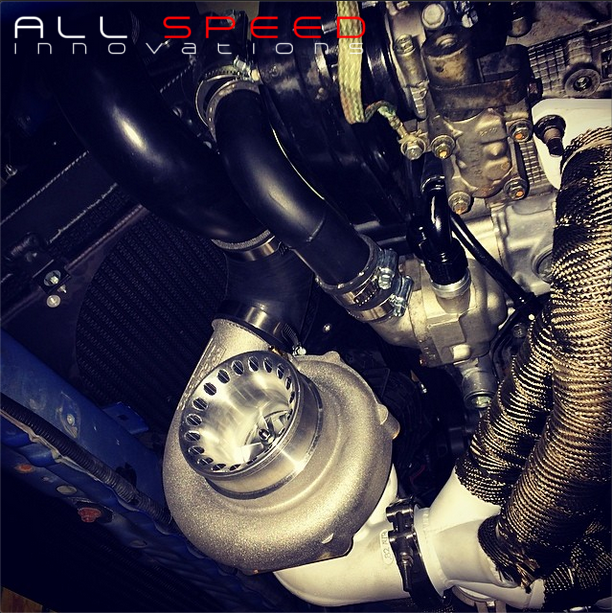 We have had a lot of success with Precision products over the past year and their waterless CHRA was a perfect match for this build with the location of this turbo. Due to the compressed time frame of the initial assembly of the car we opted to simply paint the exhaust for corrosion protection and then wrap it. Most of our builds use Swaintech coating due to its effectiveness, quality and due to the fact that it doesn’t cause the pipes to rust out like wrap does. Since we need to pull the engine, we will be coating the pipes the second time around or after scoobapalooza. The kit from nameless was very complete however we did have to finish some welding in house on this exhaust and fabricate the cold side intercooler piping to work with our setup. Here you can see the full exhaust. NASA requires that all exhaust exit behind the driver so the exhaust dumps at the center of the car and the EWG is plumbed back into the main exhaust as far down stream as possible. The whole thing tucks up close to the sub-frame and did require modification the the sub frame brace to fit and give us as much clearance as possible. Their other kits use an over pipe that follows the route of the stock up pipe but our 3.5″ tube would not fit running like that. The Intercooler piping routing is quite tight however in total there is about 2.5 – 3 feet worth, obviously significantly less than any front mount kit. We did reverse the intake manifold which required 16mm spacers from our friends at KS-Tech. The TGVs are custom ported in house. 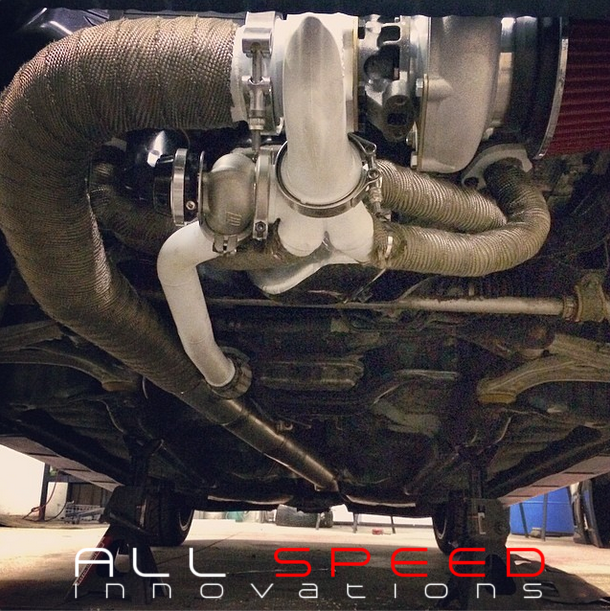 The cold side piping was also built here at ASI, some quick pie cuts and a modified Evo X lower intercooler hose (yes this car has evo parts on it) was all that was needed to create a simple shot right to the throttle body. The intake manifold and throttle body are also ported here in house. Finishing off the top side of the engine is our prototype fuel line kit complete with ID1000 injectors (yes, its in series and yes we have tested this and have reasons for using series lines rather than parallel, it all will be documented with the release of the kit). The next iteration of the fuel line kit will have a new regulator that is not from Aeromotive, will use our own fuel rails and has crimped hose ends and PTFE hose for E85 use. You will also notice the oil cooler mounted in the factory top mount location. Again, this would typically be against our normal practice, however without a turbo up there, there are not many hot parts for leaking oil from a top mounted cooler to catch fire on so we felt safe doing it. The oil cooler features a Setrab core and custom lines with a thermostatic sandwich plate. The cooler is mounted using a modified strut tower bar which places it perfectly under the scoop and an 08+ WRX shroud fits perfectly on the core and obviously fits in the STI hood giving us a prefect seal on the oil cooler. There are some things with the current setup we will be changing based on what we learned the first time around, the way the radiator and coolant pipes are currently setup make bleeding the coolant system quite difficult. We will be adding an expansion tank to the system similar to the stock tank to make bleeding much easier. We will be adding a sump to the oil drain for the turbo so that our the scavenge pump and the drain system has some room for backed up oil. The pump we use does self prime however it can be over run at times and we did need to play with the feed restrictor size to prevent excess oil from getting to the turbo and overwhelming the pump. We are also going to add another fan to the radiator, unfortunately, due to the tight confines of everything, it will need to mount to the front side of the radiator on the drivers side and push through the core. We are also going to clean up the engine bay harness, something we did not have time to do the first time. We are also considering upgrading the coilovers and going over the suspension components and replacing some of the more street oriented Whiteline parts with their race parts. We need to get the livery finished as well. We have some more late nights ahead of us. The new build will feature our own short block package and head package so we know the engine is actually built properly.